Well November is here and everything outside is dying or boringly going away for the colder weather. It's my favorite time of the year, cold. Of course this year has been a strong one from the get go. It is truly amazing for gamers. Gears of War 3, Halo: 10th Anniversary Edition, Assassin's Creed: Revelations, Call of Duty: Modern Warfare 3, Battlefield 3, Mass Effect 3 (for PS3 gamers), Skyrim oh and a little game called Uncharted 3. There is many more blockbuster games that I left out, because I want to get on to Uncharted 3! Now I have played quite a bit of the multiplayer. From the closed and opened betas to the special Subway Multiplayer Experience giveaway last month, I've been able to play a lot. All in all it has been incredibly enjoyable. If you're wondering about the multiplayer in U3, don't worry. Naughty Dog has taken everything that worked in U2 and brought it into U3. Plus countless improvements like better controls, moving environments, customizable weapons/load outs, kickbacks and a buddy system. There are plenty more they have added, but I'll save some of the surprises. Of course for the real meat of the Uncharted franchise is the story. In short, Uncharted 3 does not disappoint. Quite possibly this is the best performance put on my Nolan North and the gang. From the movements to the always near perfect dialog it is clear ND crafted yet another masterpiece. Right from the start you are thrust into the Drake's usual bout of business, but you see him in a different attire....a suit....and it's completely tucked! Joking aside ND revamped the melee system. Making one of the only complaints of U2 and fixing it. You now have so much more in the melee arsenal. Countering has never been so much fun. 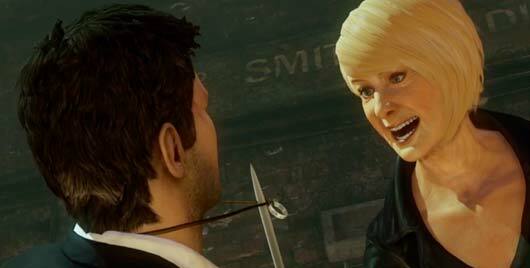 For comparisons sake Uncharted 3's melee is very similar to Batman: Arkham Asylum/City. Something I am still getting use to is the using the environment part. I get into a "mash Square til the guy goes down for good" tendency, but it's all good. Using the environment allows you to throw an attacker into something and then use the surroundings to defeat the baddies. I'm still playing the game myself and learning more and more about the people in this world. Drake has his own gang of people now and that has already added so much material to go with. I can't wait to find out more about the new faces of U3 and how everything ties together. There is one thing I do know that I can share without spoiling anything for the people playing the game too, Sir Francis Drake's ring has one more secret to reveal.